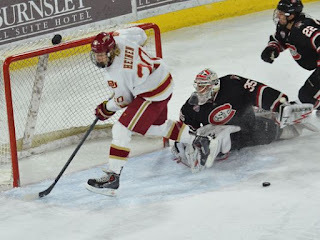 Tonight, the Denver Pioneers (7-6-2) returned home looking to maintain their unbeaten home record but ended up losing their third straight game, 5-2 at the hands of the St. Cloud State Huskies (13-4-0). The Huskies scored the last five goals of the game and perpetuated the feeling of helplessness around DU. The Pioneers got out to a fast start in the first period as they outshot SCSU 8-4. The Pioneers came out looking determined to discard the bad feelings from a week ago in North Dakota. They were skating hard, playing smart, and St. Cloud didn't have an answer for the Pioneers' attack. At the 14:01 mark of the 1st period, Dylan Gambrell found the back of the net and knocked Lindgren's water bottle off of the net to give the Pioneers the 1-0 lead. Heading into the first break, it felt like the Pios had shaken off whatever had plagued them in Grand Forks the weekend before and were well on their way to coasting to a victory over the #6 team in the country. Denver continued to play good hockey to start the second period and got on the board again early when Troy Terry buried his own rebound at the 2:31 mark. All of a sudden, with a 2-0 lead, Denver was dominating play and the Huskies were on their heels. "Right up until our first power play (8:14 of the 2nd), I thought we were playing great Denver hockey," DU Coach Jim Montgomery said. Everything changed as soon as SCSU's Will Borgen stepped out of the penalty box after the Huskies killed off their first penalty. The Pioneers couldn't generate a shot on the power play and SCSU grabbed the momentum and never let go. "Our power play has been very inept this year," Montgomery said. "That's my responsibility." On the power play, Denver was often trying to make the "pretty play" instead of the smart play. They'd pass the puck to a teammate instead of taking an open shot and eventually, the Huskies were able to continually take the puck and clear the zone. That has been the story of the power play unit all year and that's the reason why DU has only converted 13.79% of their power play chances. Just about a minute after the Huskies killed off their first power play, Adam Plant was called for hooking and the Pioneers' 85% PK unit was called on to hold the 2 goal lead. With just 9 seconds left on the power play, Blake Winiecki beat Tanner Jaillet on an unfortunate play in the crease to cut the lead to 1. Just 4 minutes later, Kalle Kossila was the beneficiary of a lucky bounce to beat Jaillet and the Huskies were off and running. At the second intermission, the score was tied at 2, but it felt like SCSU should have been up by 2 after they outshot DU 15-6 in the period. The third period started well for the Pios as they began to pressure the Huskies defense, but were unable to put the puck past Lindgren. Even on a 2 on 0 chance, the Pios couldn't find the back of the net thanks to a sprawling save by Lindgren. There were multiple times when DU had the Huskies' goalie beat, but somehow he made a miraculous save. At the 14:14 mark of the 3rd period, Joey Benik beat Jaillet off the post to give the Huskies their first lead of the night. Then, just 40 seconds later, Kossila scored his 2nd goal of the night after he stickhandled through three DU defenders. At that point, even though there was still more than 5 minutes left in the game, DU seemed to quit. They seemed disinterested in playing hockey. About a minute later, David Morley put the nail in the coffin when he beat Jaillet down low to clinch the 5-2 victory. Mercifully, a little over four minutes after that, the final buzzer came and the game was over. "St. Cloud showed why they're the #6 team in the nation," Montgomery said. "Those three goals they had in the third period were beautiful goals. If you have breakdowns in your defensive zone, they expose it." Tomorrow night, the Pioneers will look to bounce back and earn a victory heading into the three week holiday break. Tomorrow is about as important a game as DU will have this year. "[Tomorrow] is very important, especially for the psyche of the team," Montgomery explained. A victory tomorrow would do a lot towards moving things back in the right direction for the Pioneers. In short, the DU Pioneers are playing bad hockey right now. There is no magic button Coach Monty can push to make things better. The Pios have laid 3 straight eggs now and the schedule doesn't get any easier from here on out. Denver needs to turn this thing around quickly if they are going to even come close to attaining their goal of making it to the Frozen Four this year. The season is certainly far from over and there is plenty of time for the Pios to turn this thing around and get back to their winning ways, but the longer they wait, the further down the standings they'll slide. This is the first adversity the Pioneers have faced this year. How they respond tomorrow will tell fans a lot about what this team is made of. DU was outshot 33-19 on the night and 29-11 in the 2nd and 3rd periods; There were only 3 penalties called all night; Danton Heinen went pointless again; Jarid Lukosivicius picked up his 2nd assist on the year on Terry's goal; Jaillet made 28 saves for a .848 SV %; With his goal in the 3rd Period, Husky David Morley scored his 100th point of his career; Avs GM Joe Sakic was in attendance to watch Avs prospects Will Butcher (DU) and Ben Storm (SCSU). No creativity in the offensive end. We were supposed to have such an explosive group of forwards. Who expected a power outage? Thanks for the writeup ... sad to see the Denver Post was limited to an unbylined brief, the paper can't be bothered to cover the Pios any more. Glad we have letsgodu, keep up the good work. Another bad loss. DU had a solid start--skated well, pushed the pace, and played largely error-free hockey. Up 2-0, I was feeling good. Then SCSU converted a couple chances, tied the game, and then the wheels fell off. DU did have a couple good chances early in the 3rd, but couldn't convert. The rest of the 3rd period was painful. Lots of standing around, with no pace. It was sluggish and uninspired. The PP continues to struggle. DU needs to shoot the puck and stop looking for the highlight reel play. DU has given up 14 goals in the last 3 games and only scored 3. Ugly. Hoping for a better game tonight, win or lose. Those 3 goals given up in the last period was brutal for DU. I hear reports of some glass on the lobby doors got broken out caused from the air rushing out of the building. Wow. This team needs to get back to basics. Monty must be beside himself. The wheels came off of the bus along with the transmission and engine. 20 to 5 in the last five games, are you kidding? Cowley looked disinterested, for the majority of the game it looked like most of the team was just going through the motions. There was very little effort. Some of the blame has to go back on the coaching staff. This team looked ilprepared and not engaged.